Celebrate your favorite gamer with a #1 GIFT ... a Christmas ornament personalized in his or her honor! 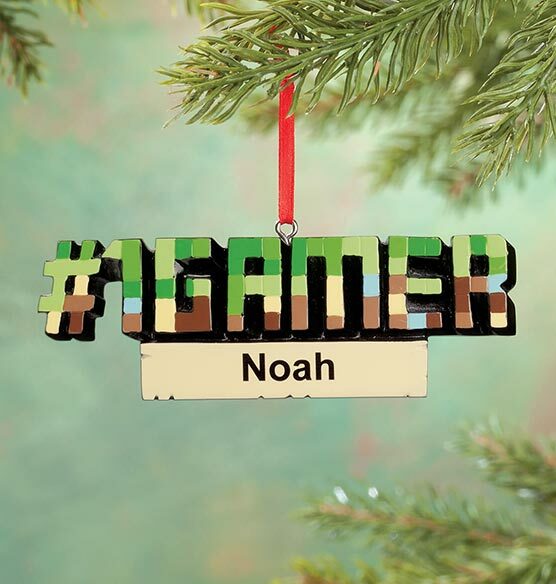 Spelling out "#1 Gamer" in block-style letters, the resin Personalized #1 Gamer Ornament may actually get your gamer to look away from the screen and check out the Christmas tree. We'll personalize at no extra charge, and you'll score points on a thoughtful gift. Specify name; limit 1 line, 16 letters/spaces. Tree ornament measures 4 1/2" wide x 1 3/8" high. We have a 6 year old that loves it! He was so excited to see the minecraft looking ornament on that tree! I was pleased to see this ornament when hunting for one for a 15-year-old grandson who loves to play video games! Perfect for the gamer for Christmas! I actually ordered 2 of these. One for my brother and one for my daughter! They both love them!